Oliver Contreras – Pool/Getty ImagesKanye West shows Donald Trump his design for the iPlane 1. 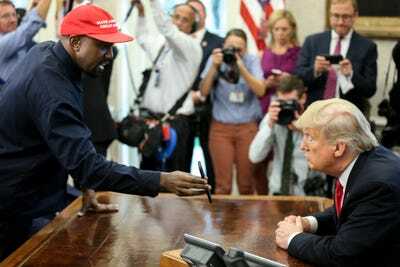 Kanye West visited the White House on Thursday and met with Donald Trump in the Oval Office. As part of an “extended soliloquy” in support of President Trump, West shared with the president his idea for a plane that would replace Air Force One. West showed the president his designs for iPlane 1, which would be hydrogen-powered and built by Apple. Apple, which does not make planes, declined to comment. Kanye West wants President Donald Trump to fly in a plane designed by Apple. In a meeting Thursday with Donald Trump, West proposed the iPlane 1, a hydrogen-powered plane that would replace the existing Air Force One. West showed Trump the design on his iPhone X – which appeared to have a lock code of “000000” – and suggested that Apple be the one to build the plane. Apple, which does not make planes, declined to comment to Business Insider. Here’s a close-up of the design that West showed the president. Telegraph journalist James Ticomb reports that West’s iPlane photo is actually an industrial deisgner’s concept drawing of an iPlane, dating back to 2012. West also treated the Oval Office to an “extended soliloquy” that covered the importance of American-manufactured goods, how wearing a MAGA hat makes him feel like “Superman,” and his recent bipolar disorder diagnosis.